Bleed Eagles Green: Philadelphia Eagles Blog: Philadelphia Eagles: Who are these guys? Philadelphia Eagles: Who are these guys? While reviewing clips of, and reading stories on, the Eagles' offseason camps, I couldn’t help but notice the number of new Eagles faces and names in camp (Unfortunately none of those faces belong to Lito Sheppard). Who are these guys, and how will each affect the 2008 Philadelphia Eagles? Let’s take a look. Rocky Boiman, Linebacker: Adds depth and experience to a young linebacking corps. Last year with the Indianapolis Colts he recorded 54 tackles and two interceptions (the Eagles can use each and every interception). Boiman also adds toughness and sure tackling to an Eagles' special teams unit that was one of the league’s worst. CK’s Analysis: With the Eagles relying heavily on a young trio of starting linebackers, confidence would be higher with a more talented veteran LB presence, like Takeo Spikes. And honestly, who heard of this guy before the signing? Not loving the signing. Luke Lawton, Fullback: Another player brought in to try and solidify the fullback position. With the Colts last year he had a total of 42 yards rushing and receiving. Makes you think the Eagles should have re-signed Thomas Tapeh. CK's Analysis: Again, who heard of this guy before the signing? Not loving the signing. Chris Clemons, Defensive End: Pass-rushing specialist who brings speed off of the edge. 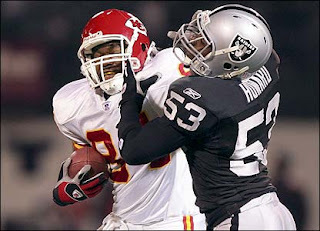 In limited action with the Raiders last year, he notched eight quarterback sacks. The Eagles could also use Clemons as a linebacker in a 3-4 scheme. Clemon’s presence on the field will increase Trent Cole’s productivity. Also, being able to rotate Clemons with Juqua Parker and Victor Abiamiri gives the Eagles great depth at defensive end. CK’s Analysis: Speed, speed, and more speed. Clemons, who was lining up opposite Burgess in Oakland, will again thrive playing opposite Cole. I would expect another 8-10 sacks. His versatility also allows the Eagles to experiment more with the 3-4 package. Love the signing! Dan Klecko, Fullback: Klecko is transitioning to the offensive side of the ball (previously a DT with the Colts and Patriots) as a fullback, in an attempt to make the Eagles' squad. Klecko’s size could mean increased holes for Westbrook to scatter through. As with Boiman, Klecko brings a nastiness to the Eagles' struggling special teams. CK’s Analysis: A signing that was once viewed as a positive comes into question with the recent signing of Luke Lawton. Hopefully Klecko stays on, as I think he could provide an Ike Reese type presence to the special teams unit. Unlikely the signing stays. Richmond McGee, Kicker/Punter: McGee has the ability to serve as a punter and kicker, as he held dual roles while at the University of Texas. It is unlikely that McGee will make the team, but can limit the use of Akers and Rocca in camp and preseason games. CK’s Analysis: Stranger things have happened. Hey, who would have thought that Rocca would have made the team over Johnson last year? Still, without an injury, it is doubtful that McGee lasts past the preseason. Oh yea, he did go undrafted in 2006, so it is unlikely that the entire league could be wrong on the guy! Unlikely the signing stays. Asante Samuel, Cornerback: Samuel was the Eagles' marquee free-agent signing. Samuel brings big-play ability to the Eagles and answers the cry for a playmaker. In 2007, the entire Eagles team had 11 interceptions. In 2007, Samuel recorded six interceptions, and in 2006 he had 10 interceptions. The big draw back is that his addition was a direct cause of this whole Lito Sheppard fiasco. CK’s Analysis: The playmaker that teammates and fans yearned for. Just flashback to last year’s game against the Patriots and Feeley’s first pass...six points the other way! Just wish that he was a starting right cornerback, as maybe Brown would have handled the demotion better than Sheppard. An Eagles fan must also hope that his Super Bowl performance wasn’t an early sign of bad things to come. Love the signing! Kris Wilson, Tight End: Wilson brings speed to the tight-end position. His 2007 numbers don’t scream playmaker, but you can’t forget that he was competing for time with future Hall of Famer Tony Gonzalez in Kansas City. Wilson can also play the fullback position if the team's other options fail. CK’s Analysis: While management never had full confidence in L.J. Smith, and since L.J. is probably gone after 2008, bringing in an athletic, speedy tight end was a must. Now, let’s hope that he does a better job holding onto the ball than Smith. His signing will also mean goodbye to Matt Schobel. Good signing. Lorenzo Booker, Running back: Booker is being labeled as another Westbrook. He brings speed, good hands, and elusiveness to the backfield. The Eagles vision two-back sets with Booker and Westbrook creating matchup nightmares for opposing defenses. However, before he is anointed the next Westbrook, he must first distinguish himself in a crowed backfield (Westbrook, Buckhalter, Hunt, and Moats). CK’s Analysis: The reviews have been raving for Booker. He is quicker than advertised, and he is picking up the complicated offense with little trouble. I can’t wait to see him and Westbrook spread out...good luck to the linebackers! We also can’t forget that he did have trouble getting on the field for a 1-15 Dolphins team. Good trading. Trevor Laws, Defensive Tackle: Laws, a rookie, has a unique opportunity to get on the field as a rookie. The starting tackles are strong with Paterson and Bunkley. However, Laws could see time as the third tackle in the rotation. Previous attempts to solidify the rotation have proven unsuccessful (Ramsey, Reagor). CK’s Analysis: Recent free-agent signings and drafts have failed to solidify the back-up DT position. Laws was one of the few bright spots on last year's struggling Irish team. Hey, he can only be an improvement on what they currently have. Good drafting. DeSean Jackson, Wide Receiver/Kick Returner: Jackson is the lone addition to the Eagles' receiving corps. Can he be a playmaker at the WR position? His impact and success next year is more than likely to happen in the return game. The reviews from camp are very positive, with Mornhinweg calling Jackson a natural at the position. His size and perceived attitude issues lead to his drop to the second round. CK’s Analysis: Again, speed, speed, and more speed. Two words: Reno Mahae. Jackson finally brings a gamebreaker to the return game. When Jackson is on the field as a WR, his speed will allow Donovan’s deep pass to thrive. Love the drafting. Bryan Smith, Defensive End: The Eagles hope Smith can turn into another Trent Cole, a dominant undersized DE. Smith's best chance to make this year’s team is on the practice squad. The DE position is deep. CK’s Analysis: Who would have thought Trent Cole would be as dominant as he was. 2008 should be a year for Smith to bulk up and learn the system (see Victor Abiamiri). Time will tell. Mike McGlynn, Mike Gibson, and King Dunlap, Offensive Linemen: Each of these picks are for the future. Runyan and Thomas are in the final years of their contracts. The Eagles are hoping for some luck-by-numbers in that one of the three can fill the OT void in 2009. CK’s Analysis: They can't be any worse then Winston Justice! Well maybe as Dunlop had difficulty beating out a freshman on last year’s Auburn team. Time will tell. Quintin Demps, Safety: The Eagles begin their search for the next Brian Dawkins. Demps brings terrific speed and coverage skills. The flip side is that his tackling ability is questionable. Like Jackson, his biggest impact on this year’s team could be as a returner. CK’s Analysis: His return abilities should be a big upgrade over J.R. Reed and Buckhalter. Good drafting. Joe Mays and Andy Studebaker, Linebackers: With the Eagles already being young and deep at the LB position, it will be a struggle for each to make the team. A spot on the practice squad would be a best-case scenario for each. CK’s Analysis: If nothing else, Studebaker was a YouTube sensation! Time will tell. Jack Ikegwuonu, Cornerback: Injuries will keep Ikegwuonu off the field in 2008. His impact, if any, will not be seen until 2009. CK’s Analysis: Gamble pick, and another example of the Eagles always drafting for next year. Time will tell.